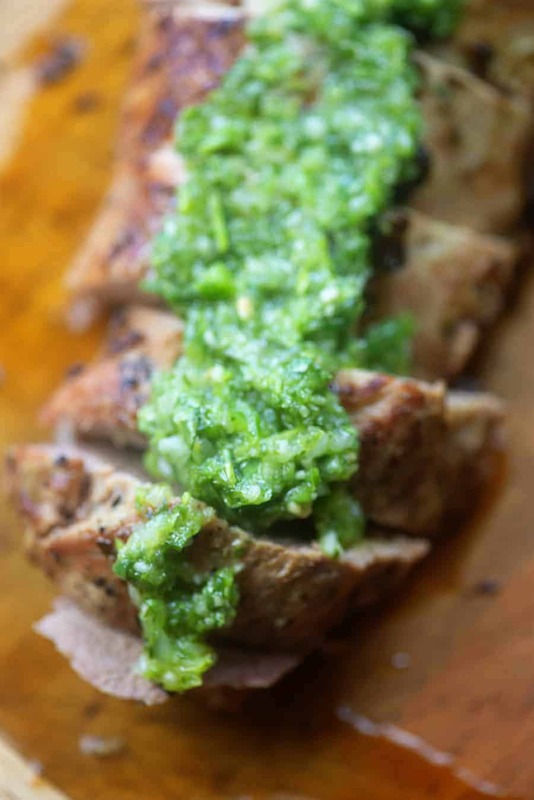 Baked pork tenderloin marinated in a simple cilantro chimichurri! This pork tenderloin is bursting with big flavor! There are a few things that I’m currently obsessing over and one of those things is cilantro. Like, I know that some of you think it tastes like soap and I guess that you’re all out there still living your life, but I’m just not sure how it has any joy in it. What do you put on your tacos? In your salsa? In your cilantro lime cauliflower rice? On top of your low carb taco soup? Anyway, today’s recipe is for the cilantro lovers. I see you out there. 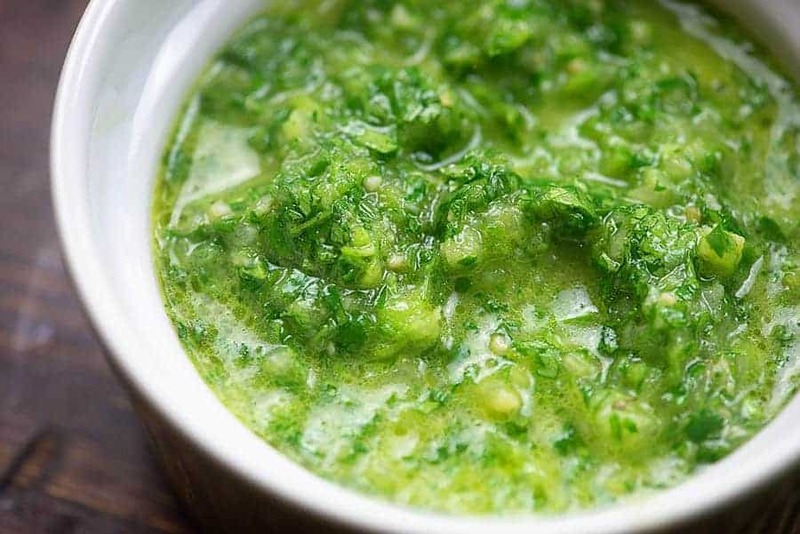 Let’s get started with this delectable cilantro chimchurri! 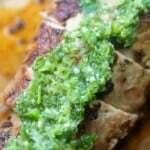 Chimichurri is a sauce traditionally made of parsley, garlic, vinegar, oil, and crushed red pepper. The ingredients all get tossed in a food processor or blender and processed together to make the most brightly flavored, gorgeously green, vibrant tasting sauce you’ll ever get a chance to dig into. I’ve swapped out half of the parsley for cilantro in this recipe, because like I said above: cilantro is life. This cilantro chimichurri also has loads of garlic, onion, and some jalapeno for a little kick. You’ll start with a cup each of parsley and cilantro. Add those to a food process or blender along with three cloves of garlic, a chopped and seeded jalapeno, some diced onion, salt and pepper. You’ll also drizzle in a quarter cup of olive oil and three tablespoons of vinegar. I use white distilled vinegar, but apple cider works as well. Process the mixture until it’s just slightly chunky. Add your pork tenderloin to a large zip top bag and pour half of the cilantro chimichurri into the bag. Place the remaining chimichurri in a sealed dish and refrigerate until ready to eat. Be sure to coat the pork in the chimichurri and then seal the bag and refrigerate for at least 4 hours. The longer the better! We’re going to make this pork tenderloin in the oven, but I think it’s important to sear it on the stove first. It gives the outside this gorgeous, crispy crust. 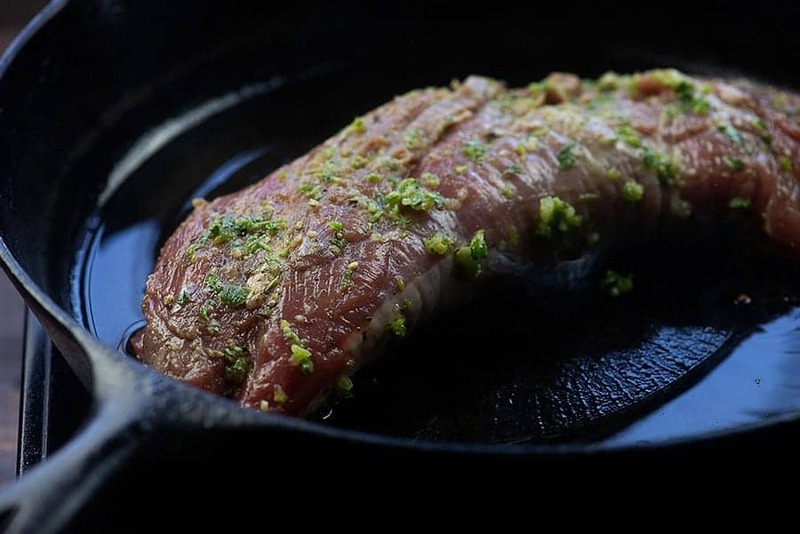 Start with a screaming hot cast iron skillet and a little olive oil. Sear on all sides until you have a nice crust. Pop the skillet into a 425 degree oven for 15-20 minutes or until a thermometer reads 145 degrees on the pork. Let the pork rest for 5 minutes before slicing and drizzling with the reserved chimichurri. There you have it! 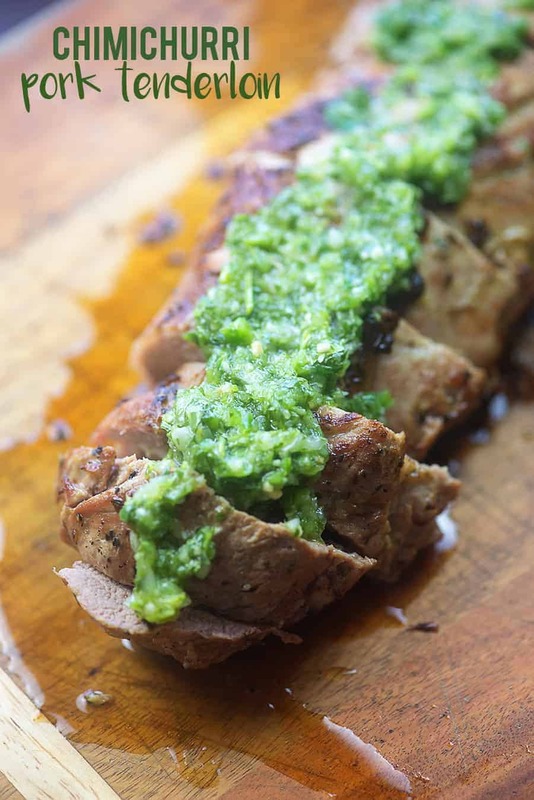 Baked pork tenderloin drizzled with a vibrant cilantro chimichurri! This whole dish is just divine and I think you’re going to love it! For more recipes like this, be sure to follow me on Pinterest or Facebook! 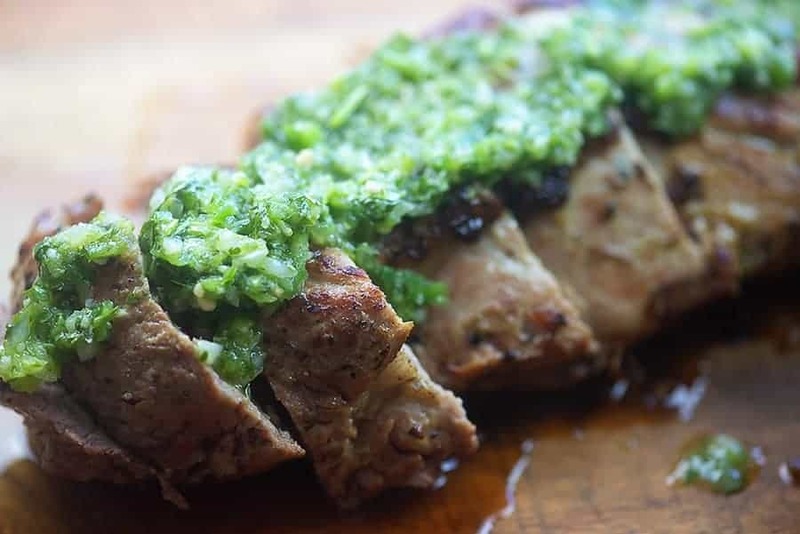 Baked pork tenderloin marinated in a vibrant cilantro chimichurri and then baked to perfection! Add the parsley, cilantro, garlic, jalapeno, onion, salt, 4 tablespoons olive oil, and vinegar to a food processor or blender and process until nearly smooth. Pour half of the mixture into a small dish, cover, and refrigerate until ready to serve. Add the pork tenderloin to a large zip top bag and add the remaining half of the chimichurri to the bag. Coat the pork in the sauce, seal bag, and refrigerate for at least 4 hours. Preheat oven to 425 degrees. Heat a cast iron skillet over high heat. Add the remaining tablespoon of oil to the skillet and heat until shimmering. Add the pork and sear on all sides, about 3 minutes per side, until golden brown. Transfer skillet to oven and bake for 15-20 minutes or until pork reaches 145 degrees. Let rest for 5 minutes before slicing and serving with reserved chimichurri. Is there another herb besides cilantro? I can’t syand that stuff!